Quick: what’s the most neglected aspect of the average home’s landscape design? It turns out that the smallest space is also the biggest challenge. Many homeowners ignore their side yards completely, leaving the strip of lawn between neighbors to languish as a sad little no-man’s land. It doesn’t have to be that way. 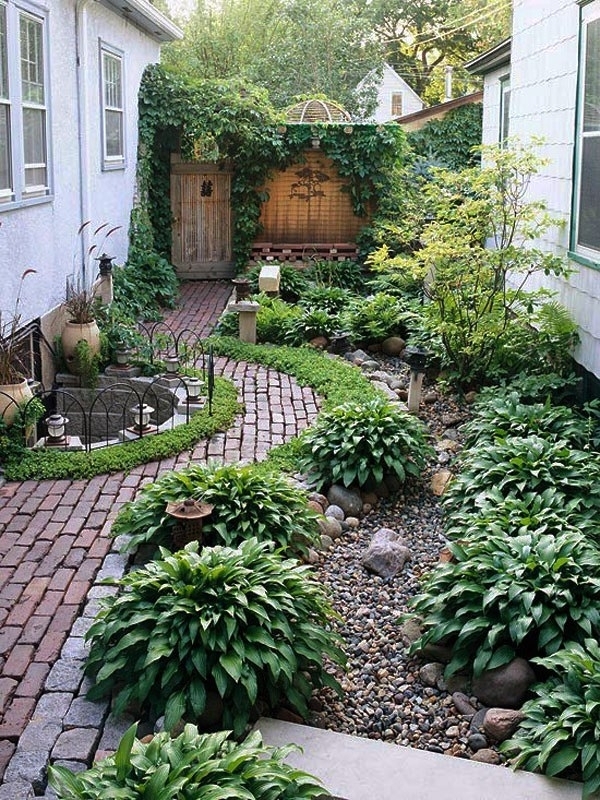 With a little creativity, you can turn the path to your backyard into a hidden wonderland. Check out some of our favorite side yards below and get ready to hit your local nursery this weekend. 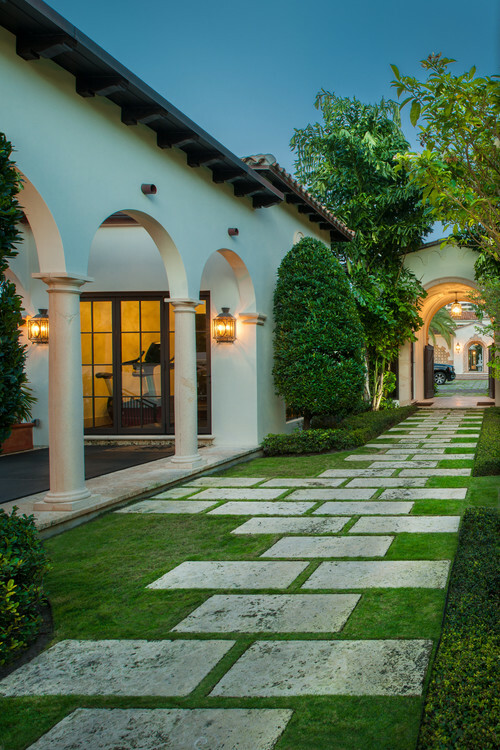 This amazing side yard puts most people’s formal entryway landscaping to shame. The tumbled brick path that leads from the sidewalk to the backyard manages to turn even a humble window well into a design feature by incorporating its curve for interest. The gravel-lined dry riverbed for drainage and lush hostas fill the rest of the space, while the closed door at the end of the path beckons the eye with the promise of an even more spectacular view on the other side. Privacy never looked so good. The best side yards combine beautiful plants with foot-traffic-friendly hardscaping, and this sunny example is no exception. This border combines varying textures of green shrubbery with a few bursts of colorful flowers. The unexpected tour de force? A flowing fountain, whose serene sounds will attract people to this small space, so add a couple chairs to create a private oasis. 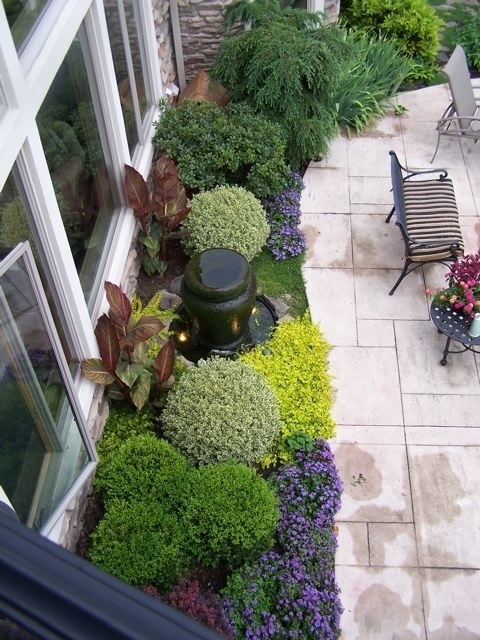 Even a side yard in deep shade can be turned into a special feature of the landscape. 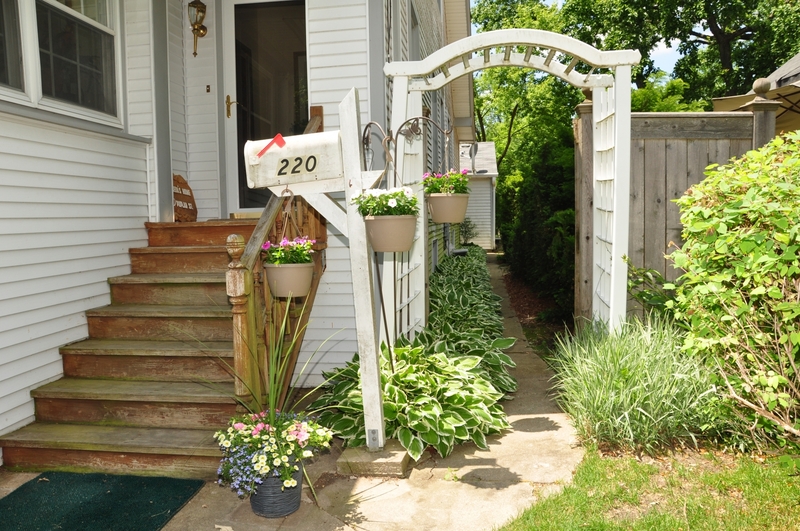 Make a statement with an arbor that acts as a doorway to the backyard. The practical concrete path is made much more inviting with the addition of a row of white-edged hosta to soften the foundation of the house. Hosta is a perfect plant for shade gardens: Its attractive leaves come in many colors and remain lush and beautiful all season long. This reliable perennial comes back year after year, and in the summer it sports lovely lavender flower spikes. If you don’t have a green thumb, you’ll be pleased to know that you don’t have to ditch your lawn to create a great side yard. Take advantage of gorgeous grass by adding some large pavers in a creative geometric pattern. If your grass isn’t up to par, try planting Irish moss or creeping thyme between the pavers instead for a green look that uses less water than good old Kentucky bluegrass.